I’ve just learned that Bill (W4FSV) has cooked up a new QRPp receiver / transmitter kit at Breadboard Radio: the Splinter II. “I have never been to Dayton or the QRP event Four Days In May. I hope to go someday, but you see my birthday is May 17th and it always conflicts. My wife, kids and grandkids insist that I’m there at my party! As thrilling as it must be to go to Dayton and FDIM, I had my own QRP adventure about a month earlier. On April 16th I finished my own building session…the Splinter II prototype. Later that evening I made the first two contacts with the Splinter II…KK4GFR, Jim in Clarkson, KY followed by KF2UZ, Jack in Hyde Park, NY. Then on the 17th, I worked SV1ENG in Greece (see above). On the 23rd I worked PA3BUD in the Netherlands. Finally, on the 24th I had a QSO with SM6CWK in Sweden. These contacts were especially nice since they were all new countries for my QRPp totals. Bill, I must say, you certainly would enjoy Four Days In May. We’ll sing Happy Birthday to you if you make it next year! The Splinter II can be ordered online at BreadboardRadio.com. Thanks for the update, Bill! 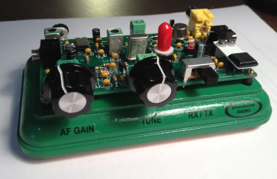 This entry was posted in Announcements, Kits, Product Announcements and tagged Bill W4FSV, Breadboard Radio, Kits, Splinter II kit, Splinter II QRPp Transmitter Receiver. Bookmark the permalink.